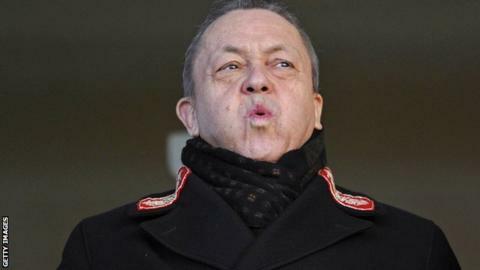 West Ham co-owner David Sullivan alleges he and a player were threatened with violence by an agent during January's transfer window. Sullivan has called for the FA to look into agents' conduct and cap fees. He said: "I can see it spilling over into violence in the future, unless there is legislation from the FA. "I had an agent threaten me and one of our players with physical violence, because he thought he was being cut out of a deal." QPR manager Harry Redknapp, whose club were one of the more active teams in the market during the transfer window, had earlier said: "Every agent seems to be trying to screw each other. It's like gang warfare out there. "It is scary. If you've got a deal for a player, another agent will try to scupper that deal if he is not involved in it. It's unreal. It's unbelievable what's going on. They're all fighting for big money, that's the problem." Sullivan claimed the financial demands by agents had got out of control adding: "We are talking millions of pounds here around a transfer and not enough deals to go around. There are too many agents and not enough transfers to feed them. "Agents who would once demand £50,000 for their part in a transfer now want £500,000 to £1m to either bring a player or keep a player. It is quite outrageous and the FA should cap the amount paid to agents for their work. "I heard of one agent, who took over representation of a player for one day, and he wanted to be paid between £1.25m and £1.5m for his part in negotiating a new contract." Sullivan also praised West Bromwich Albion chairman Jeremy Peace over his handling of Peter Odemwingie, who was refused a transfer to QPR and has now been told not to attend training until next week. Sullivan said: "[Odemwingie] drove down to QPR and was actively trying to force a transfer, but Mr Peace refused to cave in. He held his ground. "He would not be bullied. You cannot give in to players like this. It is the same as giving in to terrorists or kidnappers. If you pay the ransom, they will only come back for more. "Consequently, Mr Peace has done a great service to football."